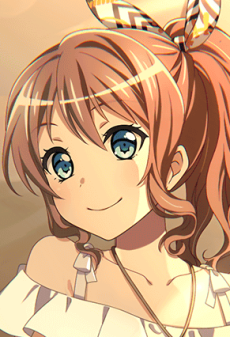 Saaya is a first-year student at Hanasakigawa Girls' High School and the drummer of Poppin'Party. She became good friends with her classmate Kasumi during their high school entrance ceremony, and since then they often eat lunch together. Saaya is the oldest of three children in her family; she has a younger brother named Jun, and a younger sister named Sana. Saaya's family owns the Yamabuki Bakery, at which she helps out, even during the school term. She also used to play in a girls' band called CHiSPA when she was in middle school, but quit because she didn't want to burden her bandmates and her family due to an incident that happened before a past performance. But thanks to Kasumi, who never gave up on her, and her mother's support, she regained her passion for music and her desire to perform in a band, thus became the last member of Poppin'Party to join. A kind, empathetic and hardworking person who cares deeply about her friends and family, Saaya often lends an ear to Kasumi and Rimi. She is generally level-headed and easygoing, and is like an 'older sister' to the other girls, always willing to help them out in hard times.